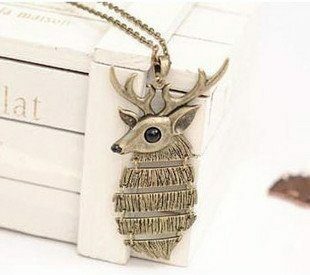 Brass Deer Necklace Only $5.69! Ships FREE! You are here: Home / Great Deals / Amazon Deals / Brass Deer Necklace Only $5.69! Ships FREE! A great piece of jewelry for the winter months! Head over to Amazon to order the Brass Deer Necklace for Only $5.69! Ships FREE! Great gift for family,friends,lovers & yourself,especially for the fashionista sports fans. Ideal gift for party,outdoor and any gatherings to make you unique and special. All products are nickel free.